In 1914 almost one quarter of the earth's surface was British. When the empire and its allies went to war in 1914 against the Central Powers, history's first global conflict was inevitable. 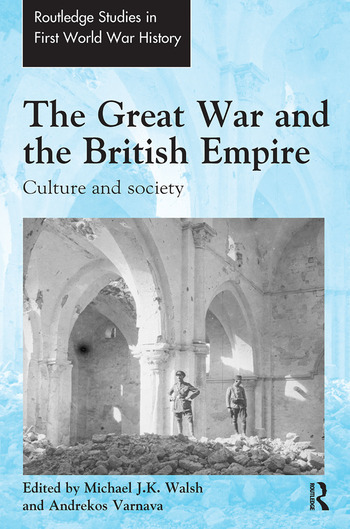 It is the social and cultural reactions to that war and within those distant, often overlooked, societies which is the focus of this volume. From Singapore to Australia, Cyprus to Ireland, India to Iraq and around the rest of the British imperial world, further complexities and interlocking themes are addressed, offering new perspectives on imperial and colonial history and theory, as well as art, music, photography, propaganda, education, pacifism, gender, class, race and diplomacy at the end of the pax Britannica. Michael J.K. Walsh is Associate Professor in Art History, at Nanyang Technological University, Singapore. He has primarily published on English painting in the first two decades of the 20th century and the art and conservation of Famagusta, Cyprus. Andrekos Varnava is Associate Professor in Imperial and Military History, Flinders University, Australia. He is author of British Imperialism in Cyprus, 1878–1915: The Inconsequential Possession (2009; paperback 2012).